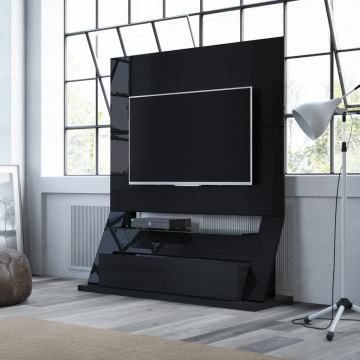 The freestanding Intrepid TV Stand by Manhattan Comfort is a sleek and modern choice for your entertainment center needs, with its sophisticated clean lines and high quality finishes. It includes a TV mount to fit a standard 50" screen and features 2 drawers with full extensions and a beautiful tempered glass shelf. Available in White Gloss, Maple Cream-Off White, and Nut Brown. The unique paint is protected by the Microban Antibacterial Protection.